Non-enveloped, round, T=1 icosahedral symmetry, 21-22 nm in diameter. 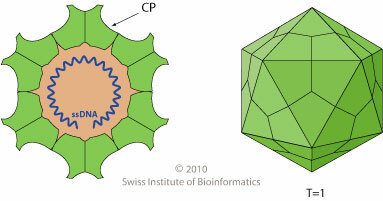 The capsid consists of 60 copies of CP protein. Linear, ssDNA genome of about 5.5kb in size. Negative strands are predominantly encapsidated. ORFs for both the structural and non-structural proteins are located on the same DNA strand. Host proteins transcribe the genomes into mRNAs. Alternative mRNAs splicing allows expression of at least eight different mRNAs. 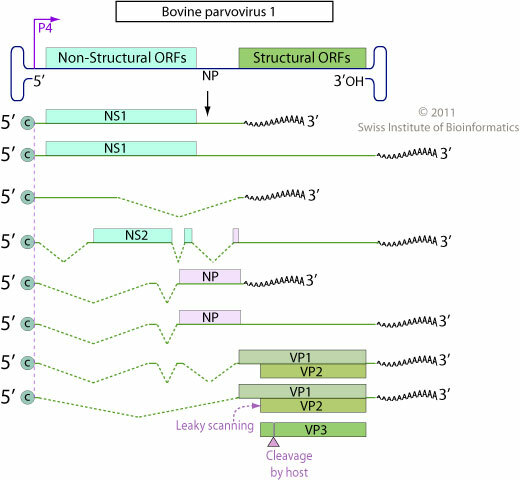 VP2 is translated by leaky scanning from VP1 gene, VP3 would be produced by cleavage of VP2. NATURAL HOSTS Human, cattle, dog. ASSOCIATED DISEASES Human: acute respiratory illness. Cattle: diarrhea and mild respiratory symptoms. MVC induces G2/M checkpoint arrest.